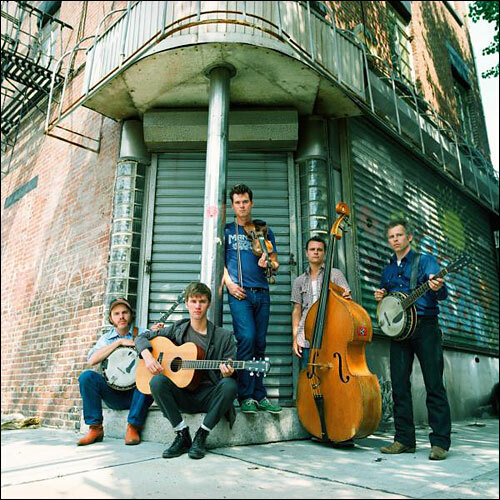 Old Crow Medicine Show Revives Traveling Tradition The five-member string band Old Crow Medicine Show got its start eight years ago when it busked and played in bars in Canada. The group attempts to recapture and honor the tradition of traveling variety shows that fanned across the United States more than a century ago. 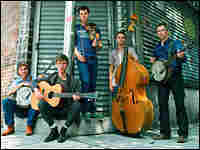 Old Crow Medicine Show (left to right): Critter Fuqua, Willie Watson, Ketch Secor, Morgan Jahnig and Kevin Hayes. Eight years ago, an American string band took its act to Canada. They spent the fall busking on street corners and playing in bars along the road. They called themselves Old Crow Medicine Show to honor the traveling variety shows — or medicine shows — that used to roam the United States a century ago. Old Crow Medicine Show has a new CD called Big Iron World. Ketch Secor sings, and plays fiddle and harmonica with the band. He says the band decided to go to Canada because they wanted the "outer reaches" of a "wild land." They also didn't want any competition, he jokes. As the band traveled across the country, they found that audiences responded to their music. "People would go get their children or their parents or friends and drag them out, saying 'You gotta see this,'" Secor says.